Every time I visit my dad, I return home with a few choice new vocabulary words and a renewed appreciation for ginger. Mind you, he doesn't put it on everything. It's just that he might put it on anything. In multiple forms, and generous amounts. With excellent results, more often than not. (When they're not excellent, they're at least interesting.) And let me tell you, breakfast porridge wakes you up a lot more quickly when it's been dosed with fresh grated ginger, dried powdered ginger, and candied ginger. At home, I mostly use fresh ginger. With a ginger grater (or even a fine cheese grater) it's as easy to use as the dried or preserved kind, and I prefer the flavor. I tend to be pretty generous with it — occasionally more than my guests would like, but at least I come by it honestly. Still, I occasionally find myself with unused stumps that sit around long enough to sprout. This time I decided to plant them. 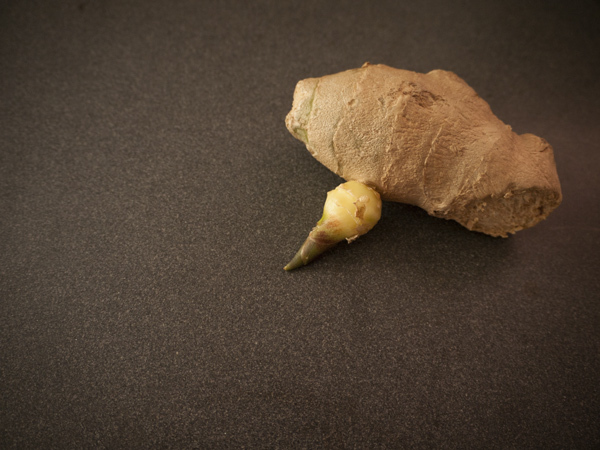 Sure, ginger is readily available at all grocery stores and has a pretty good shelf life. On the other hand, now that I know how much better homegrown potatoes are than store-bought, I'm curious to see how fresh-picked ginger root compares to the store-bought version. 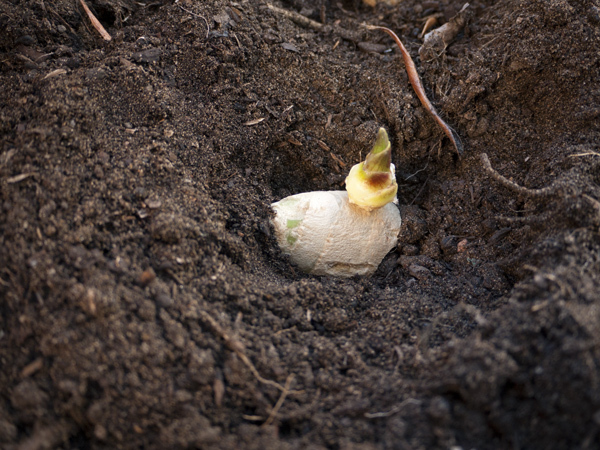 Turns out that growing ginger is a lot like growing potatoes. 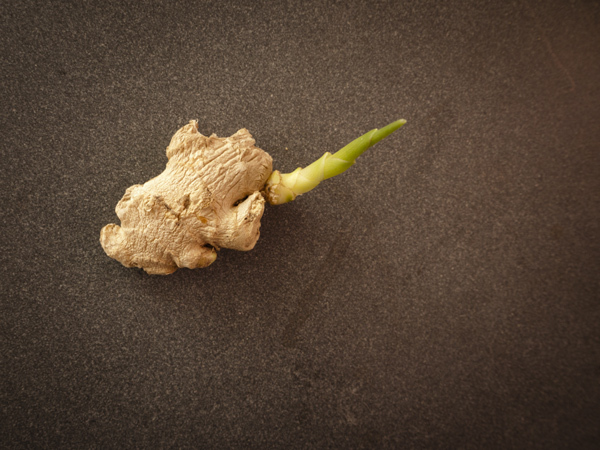 You cut your ginger root into knuckles, making sure each has at least one bud or sprout. Let them sit on the counter for a day or two so the fresh cut has a chance to dry out (reduces the chance of rot). Then just plant them in nice composty soil, an inch or two deep, with the sprout facing up. Easy. 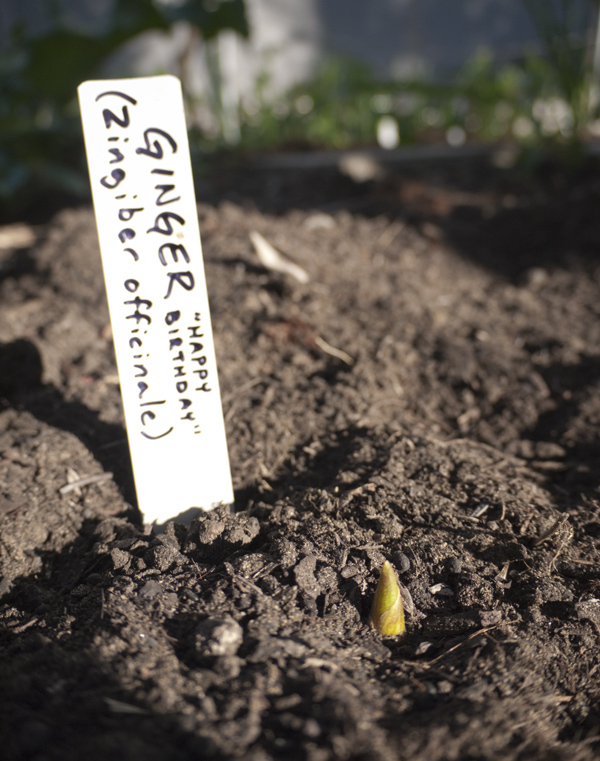 Of course, now is not exactly the appropriate time to plant ginger. Most sources I checked said to plant in late winter, and plan to harvest the following fall. On the other hand, I just picked a bunch of baby spinach and strawberries — in November — so I see no reason to let a little thing like the calendar determine my ginger planting schedule. Locals: you can see the ginger growing in the left-hand veggie bed, front left corner, where the potatoes used to be. I planted four knuckles — two with their tips just poking through the dirt, and two a little deeper, just in case.